LE TUE VACANZE NEL CUORE DEL CHIANTI DOVE NATURA E PACE SONO GARANTITE. La Capanna di Porcellina e' un bellissimo casale immerso in uno scenario di sogno, fra boschi secolari e vallate coltivate a vigne e ulivi. E' situato fuori del centro urbano, zona collinare. 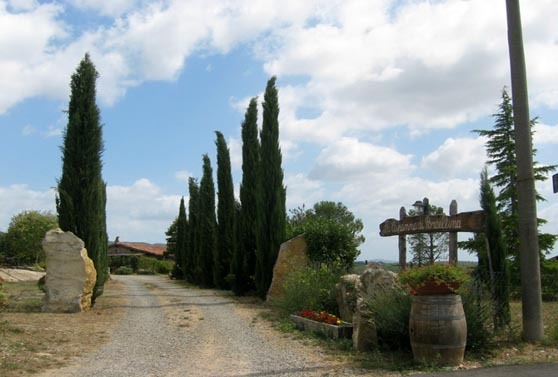 Un angolo del Chianti posto fra i piu' belli e interessanti itinerari turistici e storici della Toscana, la "strada dei castelli". Luoghi ricchi di fascino e storia, come il castello di Brolio della famiglia Ricasoli, tutti meta di escursioni a piedi, in bicicletta o a cavallo. L´edificio è completamente ristrutturato nel rispetto dell'ambiente e della tradizione contadina, ricreando un ambiente familiare completato dalla cordialità e la disponibilità dei proprietari. Wir garantieren Ihnen erholsame Ferien im Herzen des Chiantis, umgeben von einer herrlichen, friedlichen Natur. Die "Capanna di Porcellina" ist ein wunderschönes Bauernhaus, eingebettet in einer Traumlandschaft, inmitten von jahrhundertealten Wäldern, vom Menschen kultivierten Tälern, Weingärten und Olivenhainen. Das Haus befindet sich außerhalb der Ortschaft auf einem Hügel mit einem traumhaften Panorama. Es handelt sich um eine der schönsten und interessantesten Reisewege der Toskana, der „Strasse der Schlösser“. Diese Orte sind reich an Faszination und Geschichte, wie z.B. das Schloss Brolio der Familie Ricasoli, alles beliebte Ausflugsziele sowohl zu Fuß, mit dem Fahrrad oder hoch zu Ross. Unsere Ferienanlage wurde unter Respektierung der Umgebung und der traditionellen, toskanischen Bauweise komplett restauriert und bietet dem Gast einen Aufenthalt in familiärer Umgebung, geprägt von der Aufmerksamkeit und der persönlichen Betreuung durch die Gastgeber. 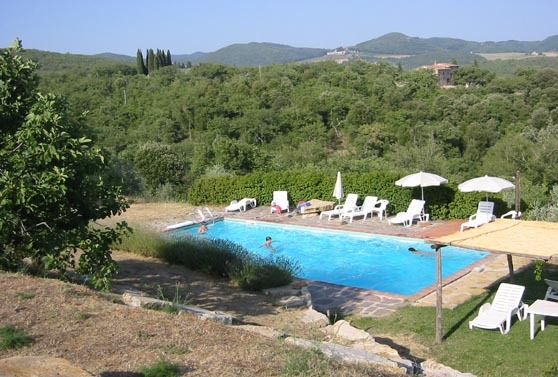 YOUR HOLIDAYS IN THE CHIANTI WHERE NATURE AND PEACE ARE GUARANTEED. In the small village of Monti, where Capanna di Porcellina is situated, you can find all the indispensable services, some shops and a restaurant. 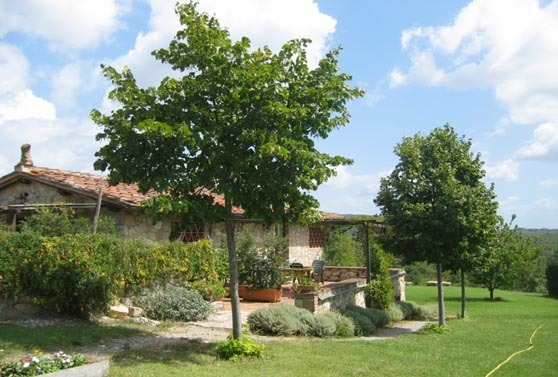 The farmhouse is very close to the most important places in the senese Chianti, such as Gaiole in Chianti, Radda and Castelnuovo Berardenga; Siena itself is just 18 kms. away. The farmhouse will welcome you in the peacefulness and silence of a pure and uncontaminated nature, offering all its comfort and relax. The building is wholly restored in observance to the environment and the rural traditions, thus creating a truly familiar setting, completed by the owners' warmth of feeling. 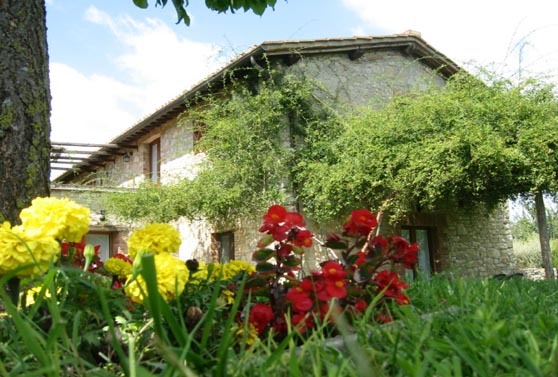 Capanna di Porcellina is a nice farmhouse set in a dreamy scenery, amongst century-old woods and valleys blooming with vines and olive groves. A part of the Chianti area close to the most suggestive historical and turistic routes in Tuscany, the so-called "castles road". Fascinating places, rich of history and beauty like the castle of Brolio, possession of baron Ricasoli's lineage; a perfect starting point for hikings, bikings or horseback ridings.